In Australia, researchers have published new findings in PLoS Medicine that claim planned C-sections may be the safest option for mothers who’ve already had a previous C-section. The study evaluated nearly 2,800 women pregnant with a second child after a previous C-section. All study participants were at least 37 weeks gestation when they entered the study. All pregnancies involved singlets and there were no complications at the time the mothers were recruited that eliminatedvaginal birth as a delivery option. About one-half the women were scheduled for a planned C-section and the other half were placed in the vaginal birth group. 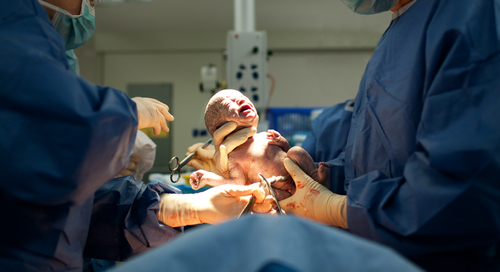 After delivery, researchers noted that women in the planned C-section group bled less than women in the vaginal birth group. Infant health was also improved with a planned C-section as fewer complications (non-fatal) occurred in infants born to mothers who had a planned C-section. Study authors believe that the results of the study prove that obstetricians have the opportunity to reduce risk of negative birth outcomes by counseling women on bothvaginal birth after caesarean (VBAC) and planned C-section. In some cases, VBAC deliveries are not an option for women who’ve previously undergone a C-section delivery. Source: CA Crowther, JM Dodd, JE Hiller, RR Haslam, JS Robinson, et al. PLoS Medicine. 15 March, 2012.